On December 13, one of the most famous of all Swedish celebrations takes place: St. Lucia Day, a festival of light in the long, dark Scandinavian winter. Traditionally the oldest girl in a family rises early on St. Lucia Day. Dressed in a white gown with a red sash around her waist and a wreath of candles on her head – these days electric crowns are often used, especially for small children – she goes from room to room singing carols and bearing her tray of lussekatter (saffron buns), gingerbread cookies, coffee, and glögg (hot spiced mulled wine). Although St. Lucia Day has developed into a uniquely Swedish tradition, the original Lucia was actually a young Sicilian woman who was killed for her Christian faith around the year 304 A.D., during the reign of the Roman Emperor Diocletian. Although Lucia had taken a vow of chastity, her mother (Lucia’s father had died when she was a child) betrothed her to a wealthy young nobleman who was not a Christian. Lucia refused to give up her faith and prayed to God to be spared the marriage. Before the wedding could take place, Lucia’s mother became seriously ill, and the two women made a pilgrimage to the grave of St. Agatha, who appeared to Lucia in a vision and told her that her mother would be cured as a result of Lucia’s faith. In response to this miracle, Lucia’s mother allowed her to break her engagement and give her dowry to the poor of Syracuse. Furious, Lucia’s fiancé reported her to the local authorities as a Christian. She was arrested, tortured, and sentenced to a brothel, but no matter what the governor’s men did, they were unable to drag her from the spot where she stood. They then tried to burn her at the stake, but the flames would not harm her. Finally, Lucia was stabbed to death, but lived long enough for a priest to arrive and give her the sacrament. Although the accuracy of these details is shrouded in mists of time, it is clear that there was a young woman from Syracuse named Lucia who was martyred for her faith and recognized as one of the most notable female saints of the early Christian Church. One version of the legend says that a young man, not a Christian, fell in love with Lucia because of her beautiful eyes. To escape the man’s passion and avoid renouncing her vow of chastity, Lucia tore out her eyes and sent them to him on a platter — which some say immediately prompted the young man to convert to Christianity. For this act of faith and sacrifice, God rewarded Lucia with an even more beautiful pair of eyes. Lucia became one of the Catholic Church’s most popular saints, and her legend made its way north during the Middle Ages, when Sweden was converted to Christianity. Still, many pagan traditions remained deeply rooted, among them the celebration of the winter solstice. According to the old Julian calendar, December 13, the date traditionally given for St. Lucia’s martyrdom, was also the longest night of the year. St. Lucia — whose name comes from the Latin word for light — became a symbol of light, and her feast day merged naturally with pre-existing winter solstice traditions. 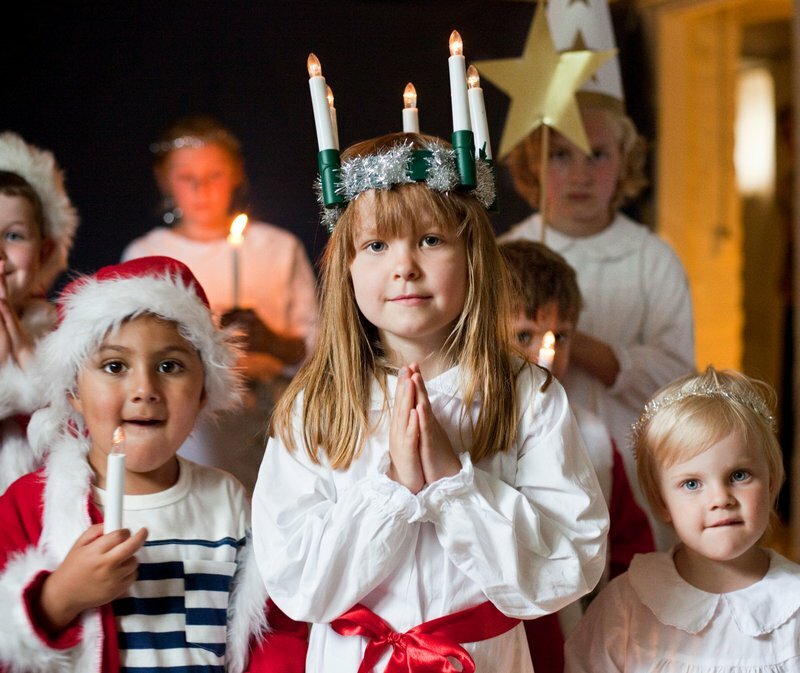 Even so, the celebration of Lucia as we know it in Sweden did not begin until 1764, when the first recorded Lucia dressed in white made the rounds at a manor in Västergötland province. 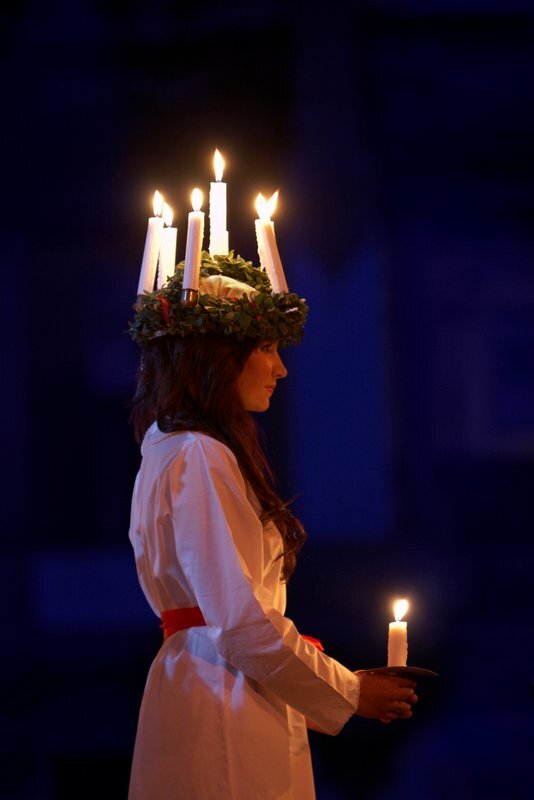 The now-famous Lucia celebrations at the Skansen open-air museum in Stockholm were first held in 1893. From there, the custom of Lucia processions began to spread to schools and local organizations. Not until the twentieth century did Lucia celebrations fully take root, greatly aided by the mass media. The tradition of a girl wearing a wreath of candles on her head has various explanations. According to one version of the Lucia legend, she strapped candles to her head to keep her hands free and carry more supplies to the poor. Others say the candles around the head represent a halo, and the red sash traditionally worn around the waist represents the shedding of Lucia’s blood during her martyrdom. Nowadays schools, businesses, associations, and towns throughout Sweden choose their own Lucias and stage traditional processions and concerts. 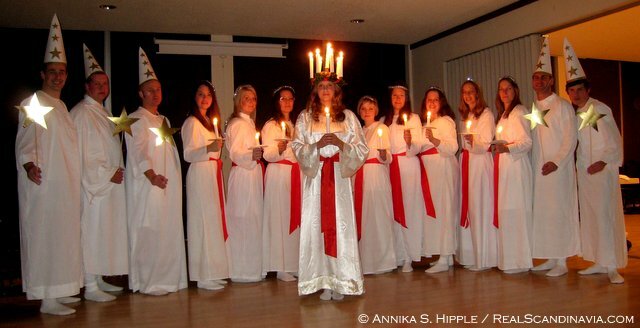 Lucia is accompanied by her handmaidens (tärnor), who carry candles and wear white gowns and tinsel in their hair, as well as star boys (stjärngossar), who wear white robes and cone-shaped hats and carry golden stars on sticks. Many processions also include children dressed as tomtar (brownies or elves) and even gingerbread people. Early on Lucia morning, Swedish television airs a live broadcast of a Lucia procession and concert featuring a different choir in a different church each year, as well as special celebrity guests. Thank you for such a thorough and informative article! I’ve been fascinated with the Swedish Lucia traditions for some years. Also being Catholic and Italian-American, I’m familiar with the martyrdom stories of St. Lucia. Because of all that she stands for (and the song “Santa Lucia” I was forced to learn as a youngster), I chose to name my daughter Lucia. She’s 7 now and knows all about the Lucia traditions in Sweden. She’s become slightly obsessed, just like her mother 🙂 So, we’re planning a trip to Sweden for St. Lucia Day 2017. Thanks for commenting! I’m so glad you found the article interesting. I hope you and your daughter have a wonderful trip to Sweden next year and get to experience some beautiful Lucia traditions. Thank you for this article. 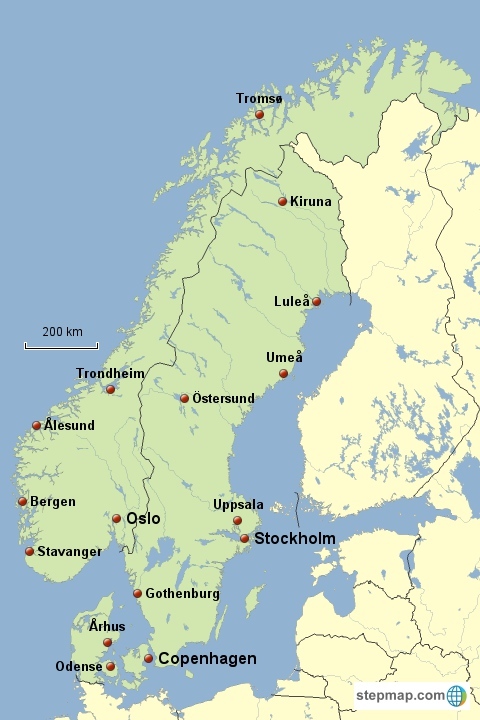 I am traveling to Sweden this December, and specifically worked the dates so I will be there during Santa Lucia day. Do you have any advice on where/how to best witness this celebration? I don’t know if it’s better to be in Stockholm or a village, or in an AirBnb or a hotel. Any advice you can give would be helpful. Thank you! One really cool Lucia event outside of the major cities takes place in the Sala Silver Mine, about an hour and a half northwest of Stockholm. I haven’t been there for Lucia, but I’m told the acoustics in the (heated) underground chamber in the mine where they hold the concert are just amazing. This event sells out really early, but they do multiple performances, and it looks like as of today, they have some tickets left for December 9, if that’s an option for you. http://www.salasilvermine.com/?huvudlink=CHRISTMASRTRWVBEWWIEURHBYWYWYE62237862H278287G2016&plats=inlagg (In case it’s of interest, here’s an article I wrote about the mine in general: http://realscandinavia.com/mine-all-mine-the-underground-world-of-sala-silver-mine/). Thank you for this article! I am an 8th grader and I am writing a research paper about St. Lucia’s Day. This article was very helpful and provided many details that other articles did not. everything about this article was great, but i am missing the Publication date. would you mind sharing it with me or telling me where to find it on this website? Thanks! I’m so glad you found this article helpful. I’ve added the publication date at the end of the article (December 12, 2014). Good luck with your paper!